JqMagick Beta Release - Please reply HERE only! Firefox 3.5.16 on Windows 7. I try to upload a file. After navigating to the file, I get a sort of candy-bar indicator and a "cancel" button, but nothing happens. It is quite a small file. I press "cancel" and choose one of the in-built images. On the "popular filters" bar, it would be good to see my chosen image used as the sample, so I can see what my image could look like with that filter. I choose the Lichtenstein filter. My image hasn't changed. I squint and see small on/off buttons, so I select "on". Still no change. I play with the sliders, but nothing happens. There's a lot of gray space on my window. I want to use it to see a bigger version of the picture. I move "options" and "image informations" [why "s"?] out of the way. Then I move "Lichtenstein", but that also moves "image informations". Okay, now I have some free space around the image, but I can't use it. The image stays small. But the magnifying glass is cute. I give up on Lichtenstein and try Motion. There is no on/off switch, but this one doesn't seem to work either. The sliders are cute, but with no text box or arrows, I can't get exact values such as angle=60. I try filter "tint". Interesting I/O under "options", but I can't do anything with it. Sliding brightness and contrast controls doesn't change the graph. I can't see if it can spit out the IM commands for the work I have done. That would be useful for me. I could upload a small copy of a 36 MP photo, tweak it, than apply those tweaks locally to my real photo. Conclusion: looks good. Shame it doesn't work for me. Hi, and thank you for your input. snibgo wrote: Firefox 3.5.16 on Windows 7.
snibgo wrote: I try to upload a file. After navigating to the file, I get a sort of candy-bar indicator and a "cancel" button, but nothing happens. It is quite a small file. I press "cancel" and choose one of the in-built images. Could you send me a link to the image (pm or hosted somewhere) ? snibgo wrote: On the "popular filters" bar, it would be good to see my chosen image used as the sample, so I can see what my image could look like with that filter. That would be great, but would require more loading time. snibgo wrote: I choose the Lichtenstein filter. My image hasn't changed. I squint and see small on/off buttons, so I select "on". Still no change. I play with the sliders, but nothing happens. snibgo wrote: There's a lot of gray space on my window. I want to use it to see a bigger version of the picture. I move "options" and "image informations" [why "s"?] out of the way. Then I move "Lichtenstein", but that also moves "image informations". snibgo wrote: I can't see if it can spit out the IM commands for the work I have done. That would be useful for me. I could upload a small copy of a 36 MP photo, tweak it, than apply those tweaks locally to my real photo. That will be added to a future update. snibgo wrote: I give up on Lichtenstein and try Motion. There is no on/off switch, but this one doesn't seem to work either. All the filters, except effects, were designed to start with no changes to the image, so as not to surprise the user with some odd warp or change of the image from some previous filter change. These other icons use rather meaningless values that were exaggerated to show some representation of what the filter does. It does make some sense to have the Effects apply to your image when clicking on the filter. With regard to motion blur, one has to change the amount (of blur) from zero to see any effect. We can switch the order of the angle and amount sliders on motion blur so that it is more obvious that the amount needs to be changed first. It's entirely possible the main problem is my ancient Firefox. Sadly, I'm not currently in a position to upgrade. the page is quite impressive and for me (Firefox 18.0.2 on Windows XP) everything worked just fine, although it took me some time to figure out that you have to turn the filters explicitly on in order to apply them to the picture. Could you explain a little bit what this project is aiming at? It clearly visualises the power of ImageMagick, but would be more instructive if it would somehow reveal how it achieves certain results, i.e. display the IM command line or the script that generates the effect. I cannot imagine that anyone really manipulates images online when GIMP is free at hand (?). So what are you trying to achieve with this project? For most of the filters we thought it would be best to have an on/off toggle so that it could be easily switched back and forth. Many of the filters we thought would be best not to apply immediately. Many have no on/off toggle, since the main slider when set to 0 is like no change. We have enabled the toggle to on by default in the Effects and Threshold categories. We will revisit enabling some of the other categories. Unfortunately, our decisions on these matter have changed as we added more filters. At some point we will likely have to correct some of them. Filtes such as arc and shear, probably do not need an on/off. But for example, spherize has no no-op case. Thus we added an on/off toggle, but to keep it consistent with the other filters in that category, we have it off by default. I would certainly appreciate more feedback on this, if you can identify some filters or categories where you think it should be on by default. For example, take the noise category. Do you think, applying denoising or adding noise to an image should be on by default? Similarly for the edge category? Except for the categories of Effects and Threshold, we felt it might be best to have all the rest start in a no change situation rather than some default setting that may not apply well to every image. With regard to the information feedback, there is some shown in the lower right corner. I had originally thought that this tool might be useful for the IM community and showing the IM functions or script name and arguments would be appropriate. But so far we have not had much feedback or hits. Thus we have been trying to think of other audiences where only the arguments may be useful. We are certainly open to more feedback. Some of the attraction to JqMagick (in comparison to GIMP or other web based applications) might be my scripts and combinations of IM commands to do things that are more unique. We also thought that having an interactive GUI based IM might be useful to novice IM users who want to see what features and capabilities it has. For the more experienced users, it could provide a test bed, if the commands and scripts and arguments were presented better. 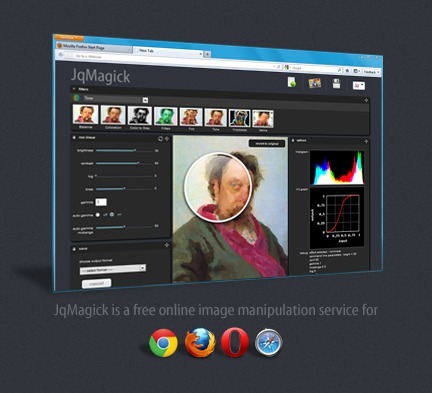 Then the user can prototype using JqMagick and then apply the same or similar settings to many images. Often it is hard to know what values are good to use and one has to do a lot of typing to test in command line mode. Having the GUI makes it easier to try things. It also gave me a good idea how my scripts work and the ability to do much more extensive testing and debugging. I have already found a number of script problems, simply because I could not do as extensive testing in command line mode. Last edited by fmw42 on 2013-02-10T20:02:28-07:00, edited 2 times in total. whugemann wrote: Could you explain a little bit what this project is aiming at? It clearly visualises the power of ImageMagick, but would be more instructive if it would somehow reveal how it achieves certain results, i.e. display the IM command line or the script that generates the effect. We thought about displaying the command line in a new window with a copy to clipboard function, but we needed to correct some features first. This feature will be added in a couple of days. whugemann wrote: I cannot imagine that anyone really manipulates images online when GIMP is free at hand (?). Well, it depends on who is using this service. We're still working on the technographic segmentation and we hope this tool finds its audience. whugemann wrote: So what are you trying to achieve with this project? I just wanted to show the power of IM & Fred's scripts through a simple GUI; plus working on this project helped me having a better understanding of Jquery and IM. And if the source code gives ideas to developpers to enhance users experience on their websites, I will consider this project a good achievement. I would think displaying the command line that the user could copy and paste into their code would be helpful. P.S. At the moment it seems to be broken; whenever I call up a filter the picture disapears. Firefox 18.02 on windows. Are you using the latest version of Firefox? I'm running FF 18.0.2 as well and it works fine on windows xp, vista, 7. Could you take a look again, we just updated the beta with new features ? Use Ctrl+F5, just to make sure no cache files are used. - IM command line display (right pannel, under histogram). - Trashbin to empty the history. - Zoom slider for the Histogram. - Zoom preview on mouseover (right pannel named preview). - All filters from the "effect" category automatically process the image when clicking on the icon. - Actions and History no longer require to reload the page. - Gray histogram for threshold filters. - All filters from the "threshold" category automatically process the image when clicking on the icon. Note the threshold measures filters are rather slow, but I will rewrite them to improve speed.